1. Check away, check into space, 1 or 2 touches to connect pass. 2. Lofted pass (older) Throw in (younger), dealing with ball coming at you in the air. 3. Receiving open hips, dribble at speed, change of direction, connect pass. 4. Repeat 3, but add overlap. 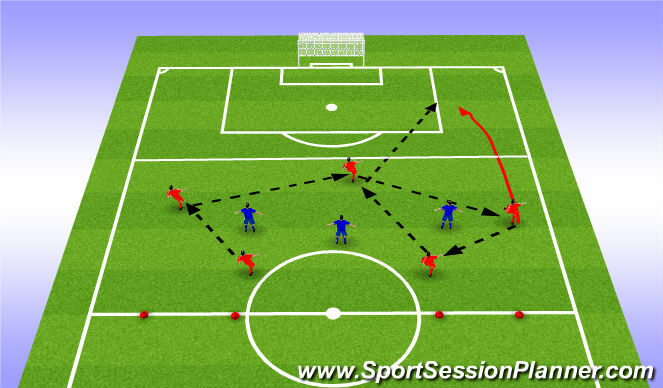 CPs: Opening hips, creating space to receive pass, 1st touch, accuracy of pass. Simple progressions with movement and realistic game situations for the offense. Focus on playing the ball through and around the opposition. 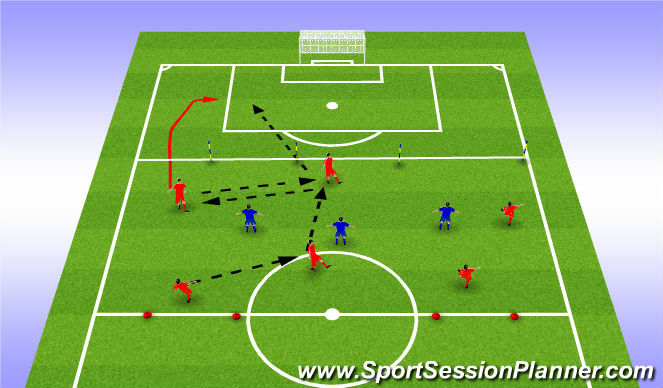 Separation from defender and quality of pass to generate effective speed of play. 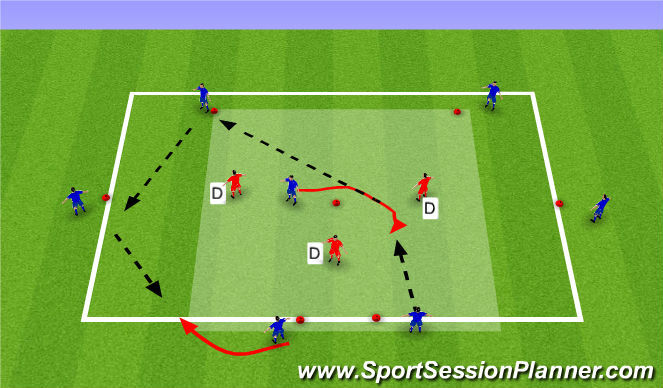 CPs: Prep touch, playing on the move, pass to proper foot, put a name on the pass, movement to create space, supporting movements, understanding game spaces, speed of play. Red team has ability to score on opposite goal at any time. Blue can score at any time. 2 Points= Getting 7+ passes then scoring (Determine the # by skill level. Team needs to understand ability to play quickly vs being patient and opening up options through possession. Recognize pressure, and ability to play through or change point of attack. Coaching Points: Willingness to possess, attack open spaces, Change of Point,Combo play. Attacking team is going to goal, but can only get into attacking half by playing penetrating pass beyond poles. Track offsides to ensure proper timing runs. Patience in possession to create the right attacking options. Players need to move and create different looks. Strive to maintain rhythm and fluidity in final third. Defense can score on cone goals at any time. CPs: Timing of runs, Communication, off ball movement, supporting positions in proper space, accuracy, weight of pass.